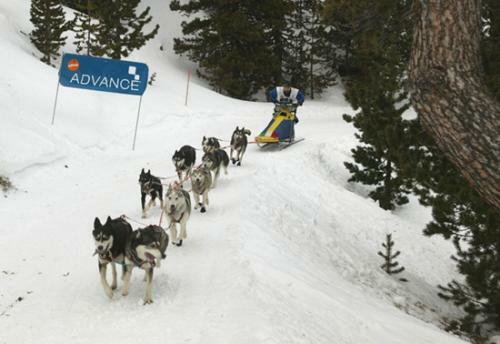 FOR TWO weeks in January competitors from around the world bring their huskies, malamutes and alaskas to the Pyrenees to take part in Pirena. 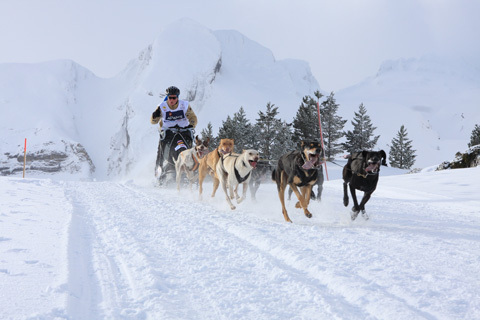 The contest, started in 1991 by Pep Parés, takes the dogs and their owners through some of the most spectacular scenery in the Pyrenees of Aragón, Catalonia, Andorra and France, on ‘La Ruta Blanca del Pirineo’ which is Pirena. At night the howl of the dogs beneath the stars, around the bonfires harks back to the beginning of humankind while the natural understanding between man and his best friend remains evident with the excellent care given to these athletic dogs. This year sees the 15th contest taking place between 22 January and 1 February 2005 as these super-fit dogs and their owners, or ‘mushers’ as they are called, compete for the Pirena Grand Prix Affinity Prize. Pirena counts towards the International Federation of Sled dog Sports (IFSS) World Cup as well as the European Sled Dog Racing Association (ESDRA) European Cup. In Pirena prizes are given not only for speed but also for those who show the most respect to the environment and the best treatment of their dogs. Care of the environment and animals are fundamental themes of the event. For several years organisers even limited its growth to a maximum of 40 to 45 sleds to protect the countryside. The trail begins in the western side of the Pyrenees in the ski station of La Partacua, near the resort of Formigal, in the Tena Valley and ends two weeks later in the Catalan ski station of La Molina to the east. Past competitors have come from Spain, Portugal, Andorra, France, Belgium, the Netherlands, Germany, the Czech Republic, Poland, Slovakia, Austria, Switzerland, Italy and Greece as well as Canada, the USA and Argentina. For 15 days and 15 nights competitors from these different countries live together on the mountains with their dogs, camping out on the peaks in fog, snow storms, hurricane winds and temperatures of more than minus 20 degrees Centigrade. Some mushers bring tents but most just put their sleeping bags next to the stake and sleep with their dogs for the night. Straw is brought for the mushers’ and dogs’ beds but dog food and materials are carried on the sleds. With such a diverse mix of languages and cultures thrown together many friendships are forged which last forever. The race consists of 16 stages, some at night, with distances of between 10 and 55 km. In addition the trails are often convoluted mountain routes with extreme ascents and descents and plenty of technical challenges including ice water races and of course the biting winds of the Pyrenees. 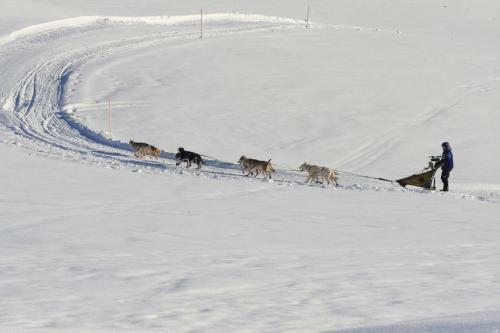 The contest has two categories; Trineos (sleds) with one or two drivers pulled by a team of 10 to 12 dogs and Skijoring, which is the hardest and combines cross-country skiing with mushing. Here the dogs are tied in a line in front of the skier. The trail demands good leaders, dogs that can sprint but also climb mountains and have an ability to overtake other dog teams. The animals are greatly specialised to race Pirena and trained to run for distances of not more than 50 km at a time and travel at 20 to 35 km per hour. At each stage the slowest teams depart first and the fastest last, at one minute intervals and within 35 minutes the whole trail is off. Imagine the action as teams of dogs depart the camp, add to that the noise of 600 excited animals barking and screaming with delight as they set off. For night stages the race trail is marked out with lights and likewise through fog. Mushers demonstrate their skill as they tackle obstacles, like open creeks and icy curves. They must be shrewd, fast and physically fit. Both men and women can, and do, take part but the important thing is the chemistry between the musher and his or her dogs. But those who take part say that good training and physical fitness of the dogs is 80 per cent of the victory. Sleds can be made of wood, aluminium or other synthetic fibres but mustn’t be dangerous for the dogs or the musher. They must all have brakes, an anchor and, in keeping with Pirena’s policy towards the welfare of animals, a space to carry an exhausted or injured dog. A large team of vets accompanies the dogs and competitors throughout the trail. Last year (2004) there were three professional vets with a vast experience of mushing between them, as well as five volunteers and a group of eight vet students from Zaragoza and Barcelona universities, giving almost a vet for every two teams of dogs. Every day the veterinary teams checked the health of the 600 dogs involved and in addition the animals were given a special high quality food. The pretty images of the mountains contrasted with the dynamism and the strength of the dogs make attractive television programmes, drawing large audiences and conveying the environmental message of Pirena. Fans of Pirena include sportsmen and women, skiers, families and ecologists.